Smithfield – Dr. Morgan Gillett Reed, DVM. age 86, died Wednesday afternoon, February 7, 2018 at WakeMed Health and Hospitals in Raleigh, North Carolina. Dr. Reed was born October 10, 1931 in Stevensville, MT to the late Gerald Evan and Phoebe Gillett Reed. He was preceded in death by a brother, Gerald Edward Reed and a nephew, Richard Reed. Dr. Reed was an honor graduate of both the University of Georgia and Auburn University School of Veterinary Medicine. Dr. Reed began his veterinary practice, Bitterroot Animal Hospital, in Smithfield, NC in 1967 and retired in 2008. 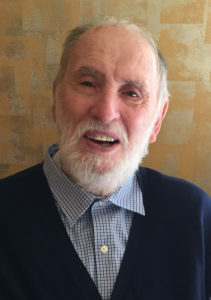 He was a longtime member of Saint Paul’s Episcopal Church and the Smithfield Rotary Club, where he was a past-president and a Paul Harris Fellow. Visitation for family and friends will be held at Underwood Funeral Home on Monday February 12th from 10:00 – 11:30 a.m. with funeral services at 2:00 p.m. at St. Paul’s Episcopal Church with Father Jim Melnyk officiating. The family will receive friends following the service in the fellowship hall. A graveside service, with military honors, will be conducted on Friday, February 16, 2018 at 10:00 am at the Greenwich Cemetery in Savannah, GA. Surviving are his wife of 59 years, Roberta Eubanks Reed; brother, Charles M. Reed of Melrose, FL; sister-in-law, Virginia Eubanks LeCraw and husband Rupert of Georgia; nieces and nephews, Iris (Reed) Cannon and Marie (Reed) Witcher both of GA, Holly (LeCraw) Howe of MA and Andrew LeCraw of GA and Godchildren, Brad Williams and Leigh (Williams) France of NC. The family would like to extend a special thanks to Dr. Reed’s longtime caregivers, Maurice McCullers and Katherine Flowers and to his close friends, Ray Brock and family and Mike and Lynda Williams. In lieu of flowers the family requests that donations be made to St. Paul’s Episcopal Church or a charity of the givers choice.